Above is a very short video of questions to ask your doctor. 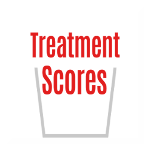 Treatment Scores software is a universal calculator that summarizes the benefit of any medical treatment down to one number (using the outcome measure important to the patient). Treatment Scores solve the problems of illiteracy, personalized medicine, evidence-based medicine, and shared decision-making. Treatment Scores are like Sabermetrics (Moneyball for Medicine). Moneyball was the very popular movie starring Brad Pitt, which was about Sabermetrics. Sabermetrics have revolutionized sports and we need to revolutionize medicine, because there is an 88% health illiteracy rate.